New survey data from Netcraft shows that WordPress is now being used on nearly 30% of all websites out there. Can you believe that! At H & E Marketing Solutions we build all our websites on WordPress. When meeting with potential clients or when teaching classes we often get asked, “Why?” Many people find the platform to be difficult to use or clunky – and it can be. We want to share our top 8 reasons why we like WordPress and why we use it for all our clients. Now before we move into why we over to why we love WordPress, we should clarify. There are two different versions of WordPress, WordPress.com and WordPress.org. With WordPress.org you own the website and the handle the hosting yourself. With WordPress.com they manage the hosting for you and you have less flexibility with your customization. We use WodPress.org for our clients and websites. So many companies come and go. There are new tech companies started every day and many won’t be successful in the long term. WordPress has been around since 2003 and has been downloaded more than 55 million times! It is also an open source software, which means that anyone can update the source code and work on the software. WordPress isn’t held by any one company so its chances of sticking around are much greater. This also allows companies to create plugins and customize the site in new ways all the time. To download WordPress basic themes on your website is free. WordPress comes out with a new standard theme each year that you can utilize on your website. If you need something more specific or sophisticated there are hundreds of thousands of themes that you can pay for to give you more options. We personally love the Divi theme from Elegant Themes, and it is what we have used on this website. According to the WordPress website, there are more than 45,000 plugins available to customize your website. Now before you get overwhelmed, there are some standard plugins that you’ll use. We’ll be writing a blog post on that shortly! You can do anything you need to do with your website with plugins and it doesn’t require any coding. Here is a great example! The Waldorf School of Bend needed to have more menu items accessible to their visitors. However, we didn’t want to make the main menu bar to messy with lots of drop downs. The hamburger menu sits on the top right corner of the website and allows them to keep the most important things on this additional menu bar. The options are endless. You can create login pages for information only a few people should see, embed video easily, change your fonts and colors, and so much more! There are easy plugins you can use to allow Google to crawl your site nicely and manage your SEO, and they’re FREE! Yoast is our favorite and one we use regularly. It helps you manage your SEO keywords on each page and even gives you tips on what you can do to improve that page. It also gives you easy access to your sitemap that you can upload to Google Search Console to ensure that you are getting the best results. WordPress is also search engine friendly as a platform. With so many integrations you can create a beautiful WordPress site that supports your eCommerce store. If you sell digital downloads, memberships or physical products there are great options. We use WooCommerce to power our website but other great options are Shopify and MemberPress depending on your offering. With your shopping cart, you can also link to several different merchant service accounts to keep you processing the same if you have brick and mortar also. If your product is selling memberships and providing digital information to them then this is a great option for you as well. You can create areas where members need to log in in order to see certain pages and content. Combining it with WooCommerce subscriptions allows you to take recurring payments to keep your business humming. With your eCommerce and Membership sites, you can also link to your email client and collect emails for your automated email campaigns. No more worrying about if your website is mobile friendly. The standard themes on WordPress are responsive, meaning designed to change size based on the device you are on. Most premium themes you purchase these days are also responsive. Divi gives us the option to toggle between tablet and phone versions on desktop to make sure the design elements we are using translate well on all devices. It also lets us make some elements disabled and not show on mobile if they aren’t user-friendly on that device. Now its worth mentioning that setting up your website from scratch if you’re not a designer or tech-savvy isn’t completely easy on any platform. However, with some basic skills, you can create a beautiful website with the standard themes that come with your WordPress site. 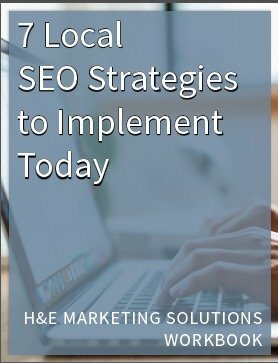 At H & E Marketing Solutions we provide training to all our clients on how to update their websites and where all their elements live. Be sure to ask your developer to do the same for you if you’re using one. We love the functionality, ease of use and ability to customize WordPress and have built sites for several different types of business. If you have any questions about if WordPress could work for you please let us know! We’d love to answer them for you. Get to desining and showcasing your amazing business.